When you animate a walking character and lock the feet down, the locked position will be perfect on the key poses. 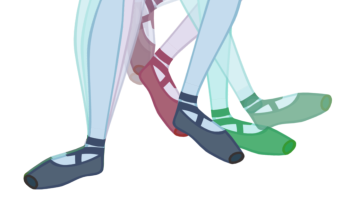 However, when you use the Motion keyframes to auto in-between the animation, you will notice a movement of feet. This motion is caused by the in-betweening of the rotations. The nail holds in place the body part on the keyframe, but it will not hold it for the whole duration between keyframes. If you place a nail on the shoulder to move just the arm, you do not necessarily want to keep the shoulder in the same place until the next key pose. You will probably want the shoulder, or any other part that is nailed, to have a slight, natural motion following the main body action. Of course, this is not the case when you fix a hand or a foot on the spot. If you have a fixed hand or foot, you will probably want it to stay exactly where you placed it. That is why you can apply an IK constraint on a frame range and on selected body parts. To fix the part on the same spot requires an angle (rotation) correction on the parts that are moving too much. 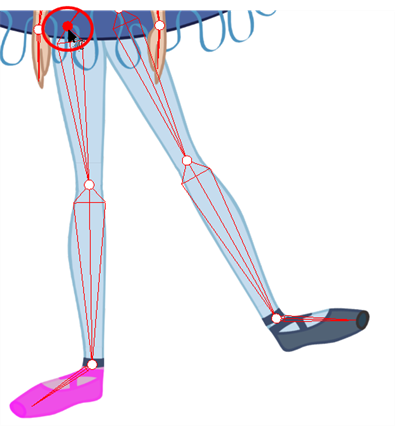 For example, to fix a foot that is moving too much, you will correct the angles on the foot, leg and thigh. To fix a hand, you will correct the angles on the hand, forearm and upper arm. 2. In the Camera view, click on the part you want to apply the constraint to. 3. In the Timeline view, set the cursor to the first frame where you want to start applying the constraint. 4. In the Tool Properties view, enable the Apply IK Constraints Mode . 5. In the Tool Properties view, click on the IK Keyframe button to enter the first frame number. 6. In the Timeline view, move the playhead to the last frame where you want to apply the constraint. 7. In the Camera view, set a nail at the top of the limb you are correcting. In the case of a foot, set the nail on the thigh by holding down the [Shift] key and clicking in its pivot. 8. In the Tool Properties view, select the type of constraint you want to apply to your piece.The most common case is a combination of the regular Nail and Hold Orientation options. 9. In the Camera view, click on the bone of the part you want to apply a constraint to. A warning message appears and requesting you to confirm that you want to add your constraint on that particular piece and for that frame duration. Your constraint are now be applied.